This is the best manga ever you guys. The title means Alexander the Great – The Kingdom of Heaven! The exclamation point is strongly implied. 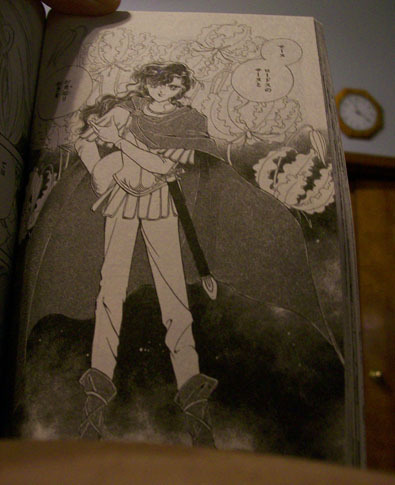 It’s all froofy angsty old-school-style shoujo manga where Alexander and Hephaistion look like twelve-year-old girls. Alexander gets ambushed and clutches his sword and thinks “Hephaistion!” And Hephaistion is twenty miles away and goes “The Prince – the Prince is calling me!” “Prince – whenever you need me, only say my name in your heart, and I will be there… to protect you!” Hephaistion is also telekinetic. And Alexander flies into sudden violent rages and kills his own men, and Hephaistion looks fearfully into the distance, his hair blowing in the wind, narrating about how he is feeling a sense of deep forboding. Oh! 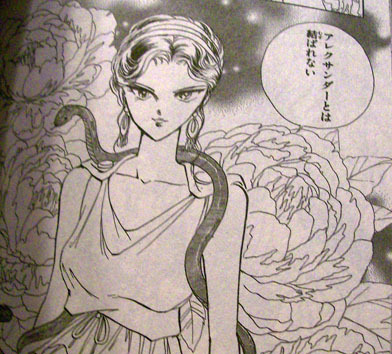 And Queen Olympias is draped in snakes all the time. Alexander is immediately enamored of her; Hephaistion feels a deep forboding. Later Alexander and Saanu will wear matching helmets, except his is white and hers is black, and they consummate their union with sprays of blood out of their enemies’ shoulders and rainbows, though unfortunately not simultaneously. In short, this manga is so great and I wish I’d bought more than just the first volume.